The images featured in this gallery capture more than 150 years of life of the two cities of Manitowoc and Two Rivers, Wisconsin. Factories, ships and railroads are all preserved in these images. Most importantly, they depict life on the lakeshore where various cultures merged to create two unique communities proud of their heritage. Originally settled by a mixture of Ottawa, Potawatomi, Menomonee and Ojibwe tribes, the lakeshore community of Manitowoc was given its name by these first inhabitants. In the Algonquin languages, "Manitou" means spirit; therefore, Manitowoc became the place of the good spirit. Manitowoc's neighbor to the north, Two Rivers, earned its moniker in acknowledgement of the two rivers that flow through the community — the East and West Twin Rivers. The photographs in this collection follow the growth of these two cities whose histories were shaped by their place alongside Lake Michigan. The waterways of Manitowoc and Two Rivers bolstered a thriving fishing industry that attracted a variety of settlers, including Native Americans, French Canadians and many more. These early fisherman used two-person boats called mackinaws, which were originally designed by fur traders. As the fishing industry grew, however, these watercraft proved insufficient in size and design for operation on Lake Michigan and its tributaries. One Manitowoc settler, William Wallace Bates, is credited with establishing it as the definitive shipbuilding center on the Great Lakes. Bates designed ships, like his celebrated Great Lakes Clipper schooner, for speed, capacity and to accommodate the shallow draft found at the mouth of many rivers that flow into Lake Michigan. His shipyard attracted a large number of skilled workers, particularly Norwegians. Waves of German, Bohemian, Polish and Irish immigrants also arrived at the docks of Manitowoc and Two Rivers. Many of these new citizens found steady work in the shipyards. In the 1860s Henry Burger, a Milwaukee boat builder, moved north to Manitowoc and established the Burger Boat Company to build large schooners and steamers. Around this time, William Kahlenberg, an engineer from Two Rivers, developed a gasoline engine famous for its reliability. Henry Burger's nephew then began a second Burger Boat Company, producing smaller crafts outfitted with the new Kahlenberg engines. Although it has changed ownership and now produces custom-built yachts, this second Burger Boat Company still operates in Manitowoc today. As shipbuilding grew in Manitowoc, Two Rivers also cultivated a rich industrial legacy developing novelty items and, later, cookware, with a new metal — aluminum. Inspired by an 1893 visit to the Columbian Exposition in Chicago, Joseph Koenig began a new business crafting aluminum combs, cigar boxes, collapsible cups and other such items in a corner of the J.E. Hamilton wood type factory. Hamilton himself boasted a professional history of innovative design and production in items ranging from wood block type, printer cases, cabinetry and automatic clothes dryers. Encouraged by Koenig's success, business owner Henry Vits closed his tannery in Manitowoc, hired away several of Koenig's tool and die makers, and established The Manitowoc Aluminum Novelty Company. The two businesses did not compete for long, merging into The Aluminum Goods Manufacturing Company, or as it was known locally, "The Goods." In 1917 The Goods launched its flagship Mirro brand, quickly becoming one of the largest aluminum cookware producers in the country. During World War II the people of Manitowoc and Two Rivers geared up to support the war effort. The Goods retooled factories to make a variety of items for the military while Burger Boat began producing wooden submarine chasers. 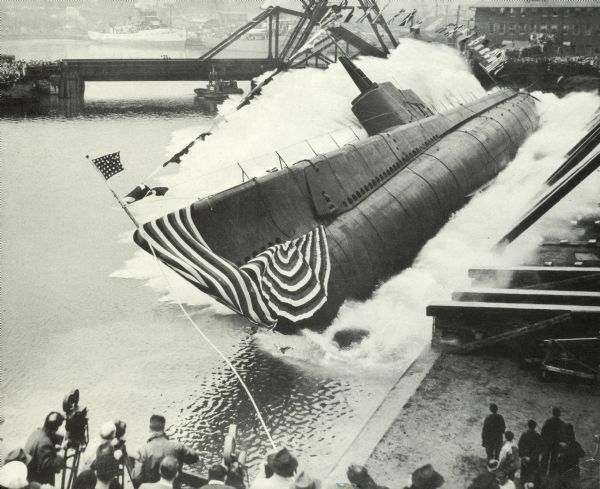 The Manitowoc Shipbuilding Company, formerly owned by Henry Burger, was contracted to build 28 submarines. The first, the USS Peto was completed 288 days ahead of schedule. After the war the Manitowoc Shipbuilding Company began producing large freighters. Soon these vessels proved too large for the Manitowoc shipyard and production was moved to Sturgeon Bay. Renamed The Manitowoc Company, it became well known for its manufacturing of cranes and ice machines. With the introduction of Teflon cookware, The Goods continued to thrive, changing its name to the Mirro Aluminum Company to recognize its famous national brand. In 1983 Mirro was purchased by Newell Companies and operations were later moved overseas. Featuring the communities of Manitowoc and Two Rivers in this Wisconsin Public Television documentary series.